Serena Williams is back to her best. TEN months ago, Serena Williams was clinging to life. After giving birth to daughter Olympia in September, the tennis superstar was treated for blood clots, including a pulmonary embolism, and didn't know if she'd live to see her baby grow up let alone win another tennis match. But traumatic memories of her complicated health struggles can be put to the side on Saturday night (AEST) when Williams plays Angelique Kerber in the Wimbledon final for a chance to win her 24th grand slam and equal Australian Margaret Court's record for most major singles titles. It'll be her 10th appearance in a final at the All England Club but by far her most unique. "This is not inevitable for me," Williams said after her 6-2 6-4 semi-final win over Julia Goerges on Friday morning. "I had a really tough delivery, I had to have multiple surgeries and almost didn't make it, to be honest. "I remember I couldn't even walk to my mailbox, so it's definitely not 'normal' for me to be in a Wimbledon final. "It's such a pleasure and a joy (to be in the final) because less than a year ago, I was going through so much." Nobody can accuse Williams of being "normal" on the court. She's always come across more superhero than mere mortal with a racquet in hand - and never has that been more evident than at Wimbledon this year. In just her fourth tournament back since becoming a mother, the American has only dropped one set - in her quarter-final against Camilia Giorgi - en route to reaching the final. After surviving that scare against the Italian, husband Alexis Ohanian expressed just how incredible her comeback has been. Williams hasn't just fought against physical ailments and the mental demons that come from being out of the game for so long. She's also had to deal with entering the year's third grand slam amid a storm that threatened her seeding as one of the top 32 players in the draw. 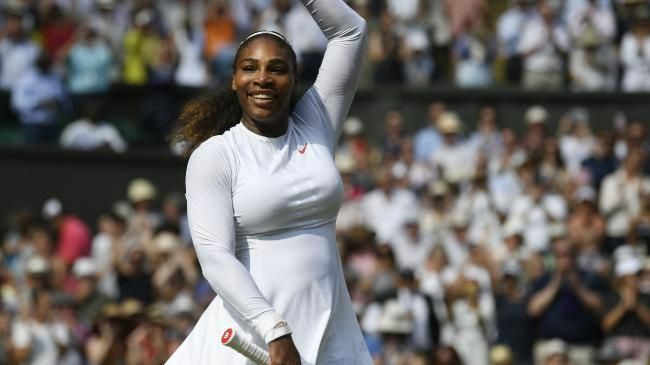 Ranked 181st in the world following her lengthy lay-off - which was exacerbated by her retirement from the French Open with a pectoral injury - there were doubts about whether Wimbledon organisers would give Williams a seeding. Players who are seeded are afforded extra protection in the early rounds of a major by facing lower-ranked opponents. By entering Wimbledon unseeded, tennis officials faced the embarrassing prospect of the sport's biggest drawcard facing a fellow big name, resulting in a genuine championship contender getting knocked out prematurely. The Wimbledon rule-book states: "The seeding order follows the WTA ranking list, except where, in the opinion of the committee, a change is necessary to produce a balanced draw." Changes are often made to account for injury, so a player who's ranked outside the top 32 may be seeded if they've only lost rankings points because they've been hurt. But given Williams' pregnancy was "totally different from an injury", Wimbledon chairman Philip Brook said, there was uncertainty about whether she would be afforded such treatment. Fortunately sanity prevailed, and the 36-year-old came into the tournament as the 25th seed. But she's made a mockery of that number, steamrolling opponents while top seeds fell like flies in week one in London. Nine of the top 10 seeds suffered early exits but all the while Williams hasn't missed a beat, much to her rivals' misfortune. The victory over Goerges extended Williams' winning streak at Wimbledon to 20 matches, dating back to the start of the 2015 edition. She's also won her past 15 grand slam matches since the start of the 2017 Australian Open, which she won while pregnant. An eighth Wimbledon crown would surely rank as Williams' most cherished, given what she's endured to just get back on the court let alone be among the final two competitors standing. "It's been a crazy 10 months," Williams said. "I was still pregnant at this time last year. That's something I have to keep reminding myself. "To hear people say, 'Oh, she's a favourite.' Like, the last 16 months, I've played in four tournaments and was carrying another human half that time. It's not frustrating, but it's like, 'C'mon, guys, this is pretty awesome.'" Pretty awesome is right, and her legend will only grow with victory over World No. 10 Kerber on Saturday night. But Williams isn't obsessing over what it would mean to equal Court's all-time record of 24 major singles titles. After all, she's had other things to worry about. "To be perfectly honest, I haven't thought about that this tournament," Williams said. "Not even once actually. In fact, I've probably forgotten about it. "I think that's a good thing because, you know, I put so much pressure on myself when I was trying to get to 18 (grand slam titles), then the rest, it was so much. "But as I said in the past couple years, I don't want to limit myself. I think that's what I was doing in the past, I was limiting myself. "It's just a number. I want to get as many as I can, starting with - I still have a match to win, so I'm not even there yet."